It’s 3 am, you’re crouched behind a corner waiting. You know sNyPdYoMaMA14 is out there, just waiting for you to peak around the corner so he can decimate you with his pulse cannon. You strain to keep your eyes open, your body torn with fatigue. NO! You can’t loose this final death match to this punk kid, but what can you do? Reach for a nasty energy drink? Attempt the dangerous maneuver of brewing a pot of coffee for 10 minutes without getting shot? Not anymore! Prepare yourself to be FOOSH’ed with the new ultimate standard of delivering precious caffeine into your blood stream. 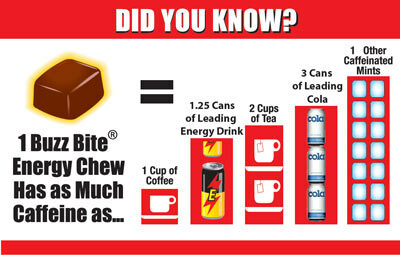 • Buzz Bites® - Chocolate & Mint Chocolate Energy Chews contain a proprietary blend of caffeine, ginseng, taurine and B vitamins, which enhance performance, increase endurance, stimulate metabolism and sharpen that edge that lets you take on life! • Ideal for students, drivers, sports enthusiasts or anyone who needs a sudden burst of energy. • Buzz Bites® tins fit perfectly into a purse or pocket and contain more power/energy than 7 leading energy drinks with 80mg. caffeine, but 1/6th the price. Xoxide Zach says - Buzz bites are crazy good! I love the chocolate taste and the kick hits you really quick! Here is a tip from the Kitchen of Xoxide Zach; I suggest freezing them and eating it like toffee or throw one in some coffee ice-cream for a super wake up sundae!